You’d think that I would have made my recipe for this month pretty far in advance given what happened last month, but in true procrastinator form, I only made this last weekend. For as organized as I am, it still baffles me on a regular basis that I can be a procrastinator as well. But enough about me. Let me talk to you about this pizza. You need this pizza. And if you can’t agree with me on that point, you at least need this sauce. Vodka sauce is an amazing creation and I am very sad to think that I spent many of my almost 29 years on this planet without it. Before making this pizza, I had two large batches of vodka sauce in the freezer and now, after this, I have those plus 7 “pizza” sized ones because I never want to used canned sauce again. And why should I when this is so easy to make and so incredibly tasty!? The two ingredients for the Improv Challenge this month are sausage and mushrooms. While I am not a big fan of sausage, I do love mushrooms. Mushrooms on pizza is one of my favorite toppings. So when I was searching for a recipe to make for the challenge, I went through Pinterest and saw I had pinned the pizza recipe. While it doesn’t call for mushrooms, I was sure there would be no harm in their addition. 1. Melt butter in a small skillet over medium heat. Add the onions and cook for 5-6 minutes or until softened. Add the garlic, tomato paste and crushed red pepper flake and cook 1 minute more. 2. Stir in the crushed tomatoes and bring to a simmer. Allow to thicken slightly, about 5 minutes. Add the vodka and cook for 8 minutes more. 3. Remove from the heat and stir in the cream. Season to taste with salt and pepper. 4. Preheat the oven to 500. If using a pizza stone, place in the oven during preheating. 5. Toss cherry tomatoes with olive oil, salt and sugar and place on a rimmed baking sheet. Roast tomatoes while the oven is preheating, tossing every 5 minutes or so, making sure they do not burn. Tomatoes are done when browned and caramelized. Set aside. 6. Roll out the dough to fit the size of your pizza stone or baking sheet. Sprinkle cornmeal onto parchment paper Transfer the dough onto the parchment paper and brush with olive oil. 7. Spread a heaping 1/2 cup of the vodka sauce onto the dough. Sprinkle with mozzarella cheese, then sausage and mushrooms, roasted tomatoes and top with the Parmesan cheese. 8. 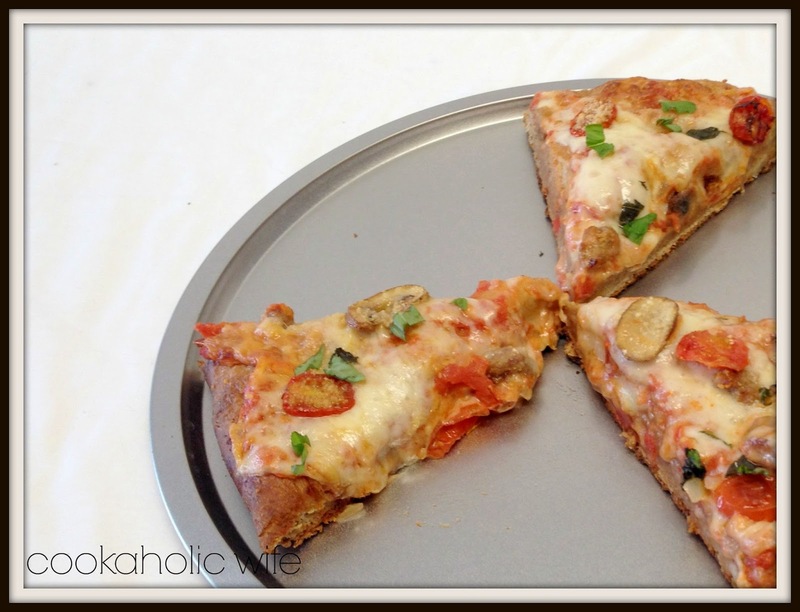 Transfer the pizza on the parchment paper to your pizza stone or baking sheet. Bake for 5 minutes, rotate and bake for another 5 minutes. 9. Remove pizza from the oven and allow to cool slightly. Sprinkle with chopped basil, slice and serve. As I expected, the mushrooms did nothing to take away from the scrumptious mingling of flavors on this pizza and only added to them. If you are having company soon and want to impress them with a simple meal, I’d totally suggest this. Everybody loves pizza and this sauce is something you’ll never forget. The only change I’d make is to use a thinner crust as I feel like when you have an excess of crust it takes away from the other flavors in the pizza. I think I might have to steal your sauce for our next pizza night. YUM! I have had my eye on this pizza recipe for awhile after seeing so many rav review…I think I need to get my act together and try it! That is one good-looking pizza. I've never had vodka sauce; I guess I need to try it! Yum, I love pizza and this looks great! This looks delicious! 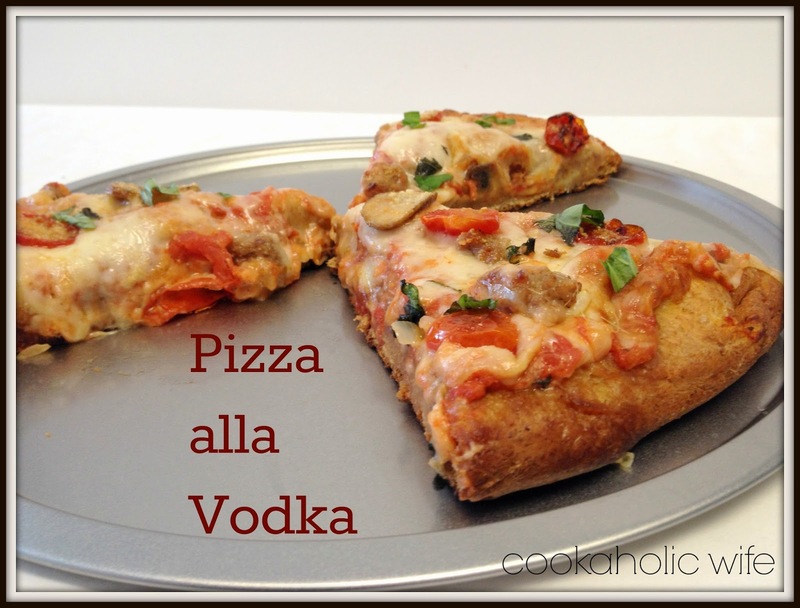 I love vodka sauce but I've never used it on pizza before – great idea! Isn't Improv so much fun?? The vodka sauce sounds intriguing! It sounds like it adds great flavor. Wonderful pizza! YUM! That sauce looks incredible!